Home > Birds Eye View > Birds – What Type is Right for You? If keeping a bird interests you, you are not alone. Humans from all levels of society have been keeping birds for thousands of years, from common folks to kings (Henry VIII) to famous explorers (Christopher Columbus) to presidents (Theodore Roosevelt). There is a wide variety of birds available as pets. Do you want a small singer who will fill your house with beautiful chirping? Or do you prefer a large parrot who will talk back to you? There is literally something for everyone. But before you bring home your new winged friend, there are a few things you must know. Your bird will depend on you for everything—food, protection, health care, and enrichment. This involves researching the type of bird you want and what he requires before purchase. Doing so will prepare you to properly keep him before you bring him home, as opposed to you scrambling around and guessing what to buy on the day you are bringing him home, or worse, searching frantically for a local avian veterinarian in the event of a health concern. Before all else, you must first commit to providing the best home possible for your bird. This means buying the optimal cage for him, like one of the EZ Care Cages that Kaytee makes. “Optimal” here means a cage of appropriate size. 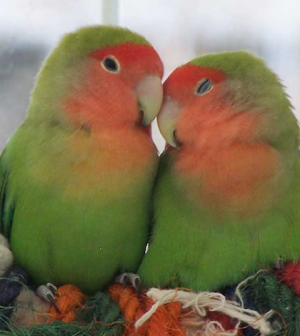 Large parrots obviously need a large cage, but smaller lovebirds can be kept in groups in a smaller enclosure. Also, you must clean it regularly—birds must have a clean place in which to live. Unlike dogs, who eliminate outdoors, birds excrete their wastes in the cage. You must therefore clean the enclosure, and often. You must also provide the right diet for your bird. You can learn which foods are appropriate and which ones to avoid through research. For example, premade mixes and pellets are available, but you can offer your pet plenty of fresh fruits and vegetables—but not avocados. It almost goes without saying that you need to keep your bird healthy and happy. Besides seeking veterinary help if and when necessary, you must provide what is called enrichment. Basically, make sure that your bird has enough toys and cage accessories to help him entertain himself, which in turn will entertain you. Boredom in birds can lead to many health and behavior problems; bored birds may shriek, chew on themselves, and become overly fussy eaters, to name just a few possibilities. To fight boredom, rotate your bird’s toys on a weekly basis. Also, spend time with him every day, and rotate what activities you do with him every day as well. The most important thing to remember when interacting with and handling your bird is that you must work hard to earn his trust, and then you must never do anything to betray that trust. Birds have long memories, so act in a trustworthy manner around your pet at all times. Although he doesn’t operate in a vindictive or vengeful way, your bird will remember both good and bad things that are done to him, and he will be less likely to trust you completely if something bad happens to him. There are many types of birds available, and some are better suited for first-time bird keepers than others. Parakeets, cockatiels, canaries, and some species of finches are all great choices. However, most canaries and finches aren’t as inclined to leave their cage for playtime or cuddles as many parrots are. Some parrots, like African greys and Amazons, can grow in excess of 13 inches (33 cm) and therefore may be too large for some people to care for. Always research the bird who interests you so that you know what to expect. You can read books, search for bird websites and forums, contact breeders, and attend local workshops to learn more about your favorite bird. You can obtain your bird from a pet store or a local breeder. Many young birds will be available, or you may be able to adopt an older bird. Do your best to determine why the animal is being offered for adoption—sometimes people simply pass along a bird with behavioral or physical problems. 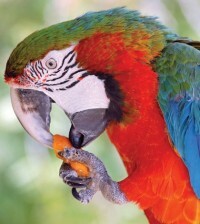 For an experienced keeper, these may be easy to correct or treat, but a first-time bird owner may not be able to handle such a situation effectively.